I am always so stoked when non-veg restaurants offer up a vegan option to their customers! 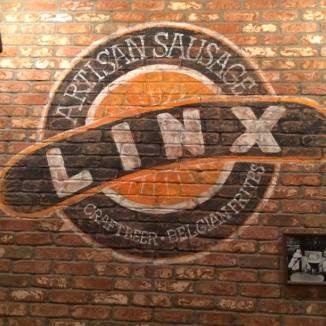 So when I heard that LinX Artisan Sausage in Old Town Orange was serving up a vegan hot dog, I couldn't wait to go down there and check it out! I've said it before and I'll say it again - we are spoiled with vegan food places here in Orange County! We are so spoiled that in my 6+ years as a vegan I haven't even been to all of them yet. Shocking, right?! Plus, new ones keep popping up! I'm definitely not complaining, it just means I have oodles of options when it comes to dining out! A new vegan restaurant called "Vegan Cuisine" opened up within the last two months in Fountain Valley, California, less than 10 miles where I live. After some friends posted pics on Instagram, I knew I had to check it out! This is another restaurant that serves vegan Asian food, but they also have some good old fashioned Americanized comfort food like fried chicken, burgers and even lasagna on weekends! Last month Mister Spooky and I were having a fun morning at Universal Studios (read all about it and their vegan options), hanging with the Universal Monsters, Beetlejuice and Norman Bates, but we finished up around lunch time and were looking for a nearby vegan place to eat. Lo and behold, just down the street (or down the hill) was a small restaurant called SunCafe, which is a mostly-raw vegan restaurant serving up organic and healthy food. We decided to check it out since it was so close. The street parking is metered, and they don't have their own parking lot as far as I could tell. We had to park a ways down the street and walk back up, which was no biggie, but I can see parking being an issue, especially on busier days or weekends. When I walked in, the place was pretty packed (it was Friday at lunchtime, so it wasn't surprising), but we were seated quickly and the service was attentive. We had actually eaten previously at Universal Studios, so we decided to go easy and just order appetizers and drinks. I could not resist ordering their Orange Cremesicle Shake, which is a raw drink containing just fresh orange, pineapple and agave, topped with coconut shreds and goji berries. It was delicious and tasted just like an Orange Julius (confession: I used to get those all the time at the mall as a teen in my pre-vegan days!)! This Orange Cremesicle was dreamy and definitely hit the spot! I love Trader Joe's and always love how they have neat new vegan options! Last month, I noticed they had a new Chicken-less Salad and I just had to try it! The "chicken" salad is made from vegan chicken, carrots, celery, currants in a light, mayo-like (vegan) sauce (sorry I don't have a more comprehensive ingredient list - I didn't photograph the ingredients and I can't seem to find an ingredient list online). Upon opening the package, it looked pretty good. The only thing I wasn't too enthused about was that the sauce seemed to be a bit runny. Nevertheless, I felt like I was ready for a picnic with this Chicken-less Salad! I apologize for the long absence, readers! I've been busy with the day job and have just been so exhausted lately...so exhausted, in fact, that I actually came down with a nasty flu bug, which is why I actually have some time to write now! However, I do plan to make more time to write because I have lots and lots of posts to share with you! First off, I wanted to share with you the lovely birthday dinner I had at Au Lac restaurant in Fountain Valley, California (way back at the beginning of January...that is how far behind I am, yikes!) with my Mister Spooky. Au Lac is a vegan and living foods restaurant that focuses on Asian food. All of their items are vegan and they have a separate menu for their "living foods" or raw foods. They also carry many teas and health elixirs as well as a variety of desserts. It is considered a higher-end vegan restaurant, and their Chef Ito is world-renowned. It was my first time at Au Lac, and while it is in the middle of a weird little strip mall that doesn't really make you think "vegan haute cuisine", the inside was pretty cool. The dark red walls, red lighting and Asian decor made it feel opulent. We had reservations and were seated quickly. I felt like there was some confusion as to who our waiter was initially, but that was soon cleared up as we had a very helpful and friendly waitress.